My sister is a public school teacher and occasionally we work together to create something for her classroom. 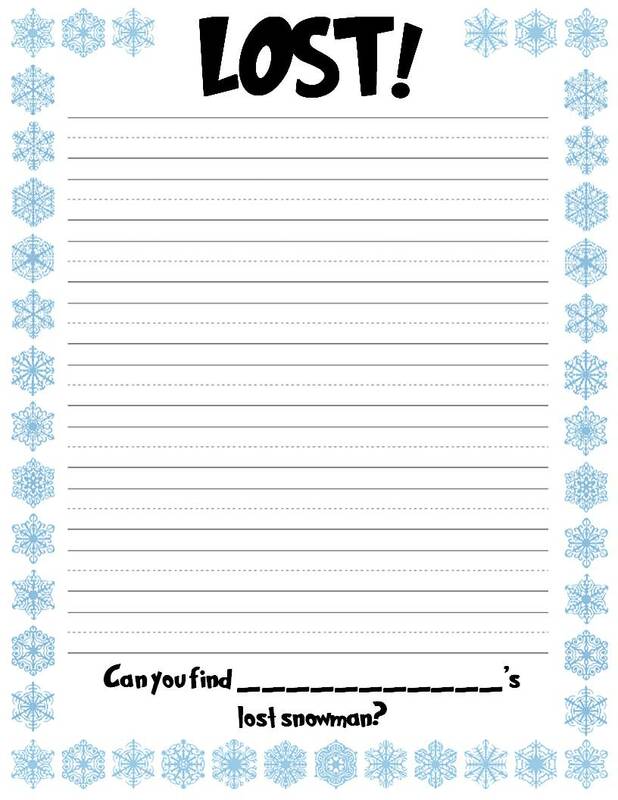 Last winter she asked me to put together a snowflake themed writing template for a fun snowman activity. Her students loved it! Yours will too! The idea is this. 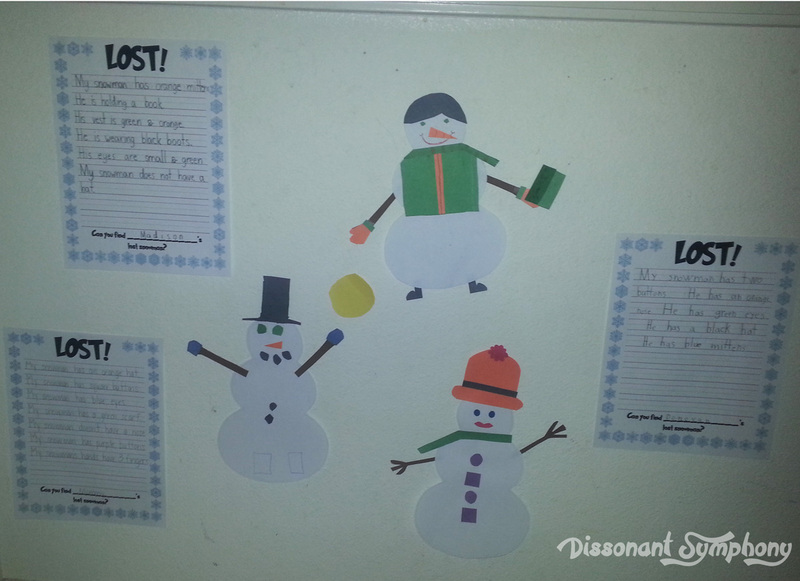 Each student gets a snowman template (free printable here) and a LOST! piece of snowflake paper (free printable here). Discuss with your students that every snowflake and snowman looks different. I told my kiddos that God made snowflakes unique — just like He made each person completely amazing and special. 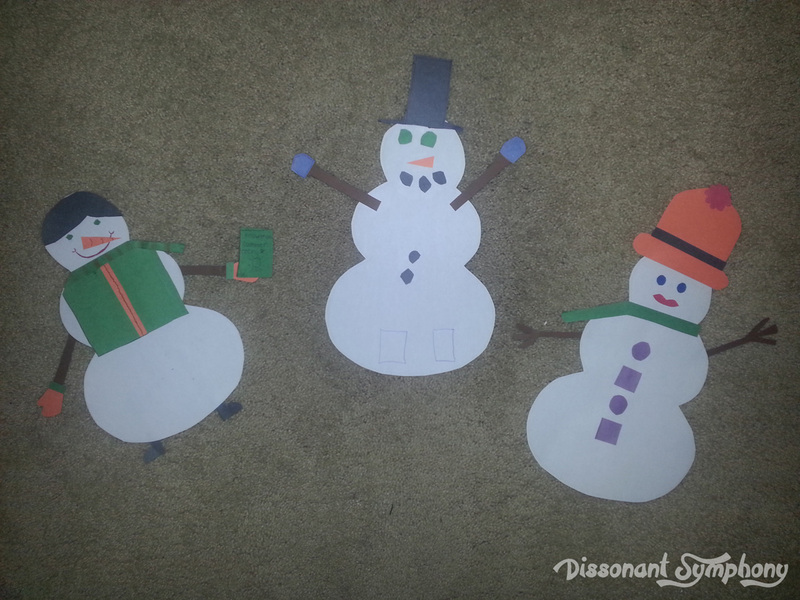 Give them some construction paper to create accessories for their snowman/woman. Discuss what kinds of details their snowman/woman might have. Hats (what kind–knit, baseball cap, top hat..), stick arms, gloves or mittens, a scarf, face details, buttons…the possibilities are endless! Then, let them create! When their snowman has come to life, it’s time to describe it! Each student writes 4 (or more depending on ability) details about their snowman. Feel free to give them starting ideas “My snowman is wearing…” or “My snowman has…” Then, the snowmen and descriptions go up on the wall for others to figure out who’s goes with which description. Yes, someone in our house thought it was very important to have a sun shining down on the snowmen. Thanks to Justaddclipart for the great idea! Blank snowflake paper, and lined snowflake paper here!! I recently traveled to Chicago to enhance my copiousness. Yes, that was a stated purpose of the training I received there. To grow my mind and experience an abundance of historical thinking. I love the saying “If you are the smartest person in the room, you’re in the wrong room.”, and try to model my relationships after that premise. I’m happiest when surrounded by those who enrich my thoughts and encourage me to develop big ideas. Never was this more true than during my time at CC’s Practicum Speaker Trainer Training. That’s training for those who will be training practicum speakers. A room full of CC folks with a passion for classical education, equipping others and public speaking. It was like returning to the mother ship. These were my people all the way down to our very core. Intentionally, I scheduled my homeward flight for late in the evening, so I could traipse around Chicago for a day. My primary goal was to see The Art Institute of Chicago’s Impressionism wing. Specifically their room full of Monet. 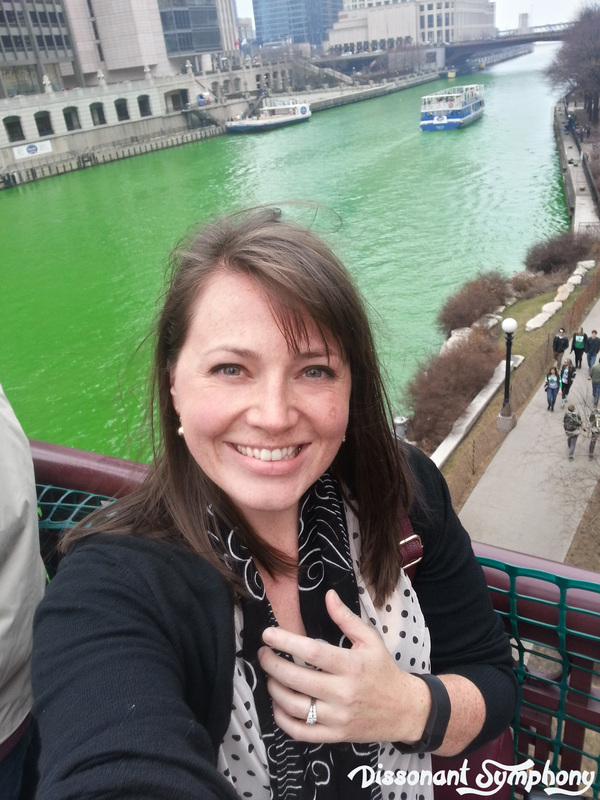 It just so happened my trip coincided with Chicago’s St. Patrick’s Day Parade and the dyeing of the river green. Not a deep natural forest green, but a bright psychedelic emerald. The garish color was mimicked all around me in thousands of people enjoying the celebratory mood of the day. They started partying around noon by 5pm had reached a fever pitch even my Uber driver was anxious to escape as he happily left the city to deposit my un-drunk self at the airport. Apparently I was the only sober fare he had all day. I’d rambled around the museum for almost two hours enjoying Greek, Roman, Modern and Ancient Indian art, but longing for Impressionists when I caught a glimpse out of the corner of my eye. Just the very edge of a painting hugging a corner two rooms away. I knew instantly it was Monet and proceeded to avoid group tours and step around slow-moving elderly in my haste to see the full painting. As I stepped into the room, I was overcome with awe. A dozen masterpieces by the great French impressionist encircled me. There to be savored. As I moved around the perimeter, I looked at each painting twice. Once as close as I could muster (without a docent scolding me anyway) to see the smallest detail, then a few steps back to observe the painting in toto. As I repeated this process, my awe gave way to an emotion not easily described, but one which created in my soul a desire to sit and weep. I am not a crier. Not at movies, Mother’s Day, loss, happiness, not for much of anything do I shed tears. As such, this overwhelming flood of sentiment disquieted me enough that I found a nearby bench and sat struggling to compose myself while gazing at Monet’s Water Lilies. I lost my battle to hold back tears as I identified the root of my emotion. My eyes were suddenly opened to a little of God’s perspective. As I muddle through life, moving from the mundane of laundry, to the routine of homeschooling, groceries and dishes, I tend to become tunnel visioned. My world seems incredibly small most of the time. I’m just trying to get through the next task, whatever is the most pressing concern or need of those around me. Often, I can’t think past Tuesday to make plans for Friday. 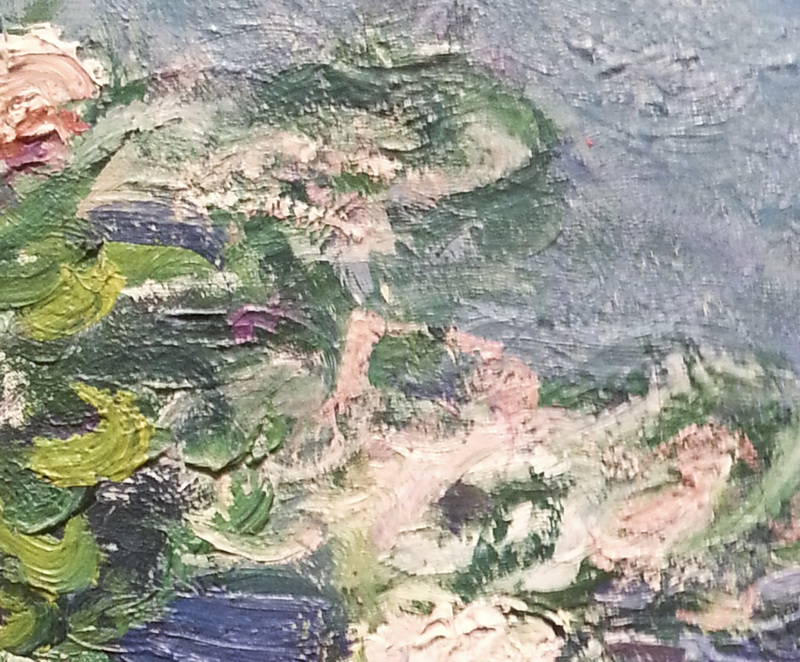 As my focus narrows, life becomes a Monet up close. It feels pointless, just a swirl of nothing layered over more meaningless smudges. Life going around again and again in a jumble of details, relationships and tasks, with no value, no broader purpose. As I managed to (finally) get a grip and head out of the room, I glanced back at the painting that first caught my attention and had another realization. If our lives encompass God’s creative genius, shouldn’t they shout His unmistakable composition in the same way Monet’s color and form drew me in from two rooms away? As Christians, our lives should be a demonstration of who the Lord is. His truth, grace, love, patience and gentleness should flow from the canvas of our soul. 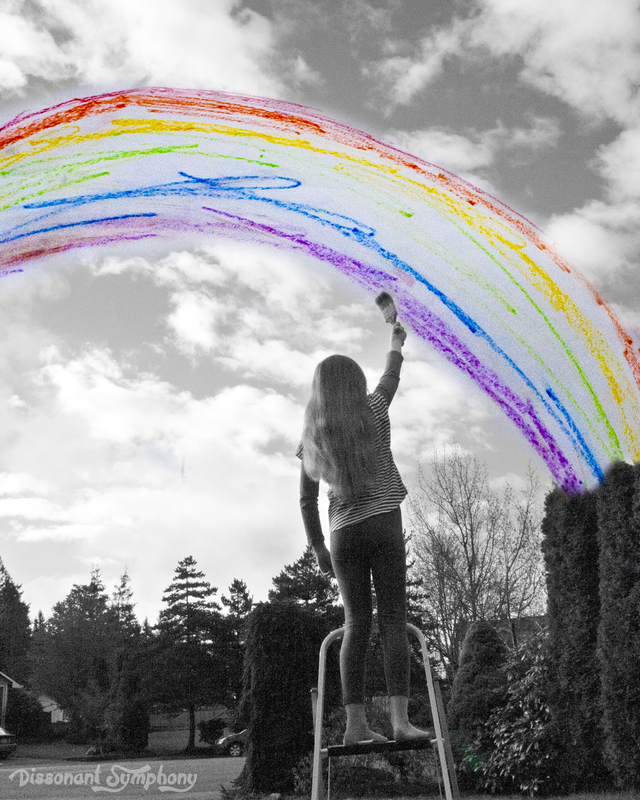 The mural of our being should be a reflection of The Great Artist who created us. Imperfect and flawed, we are a fallen jumble of brushstrokes when viewed up close, but a stunning expression of the Master’s hand with the proper perspective. His. Monet gave me a glimpse of that viewpoint, and I am eternally thankful. I found this whimsical, magical idea on Pinterest. Genius in its simplicity, I knew I could recreate it easily with my kiddos. You can too! We tried something a little different last Easter. 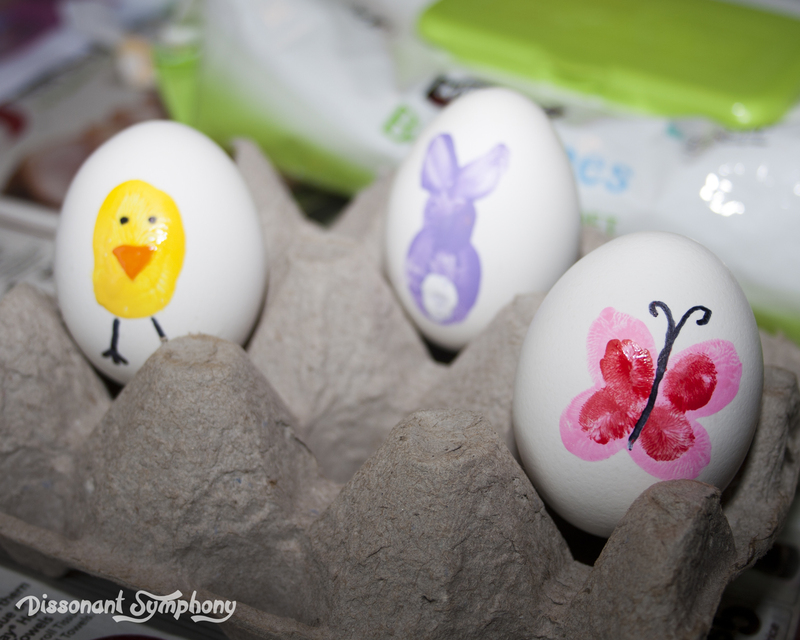 Instead of dyeing eggs, we fingerprinted them. It was a fun change of pace and the kids loved coming up with designs. 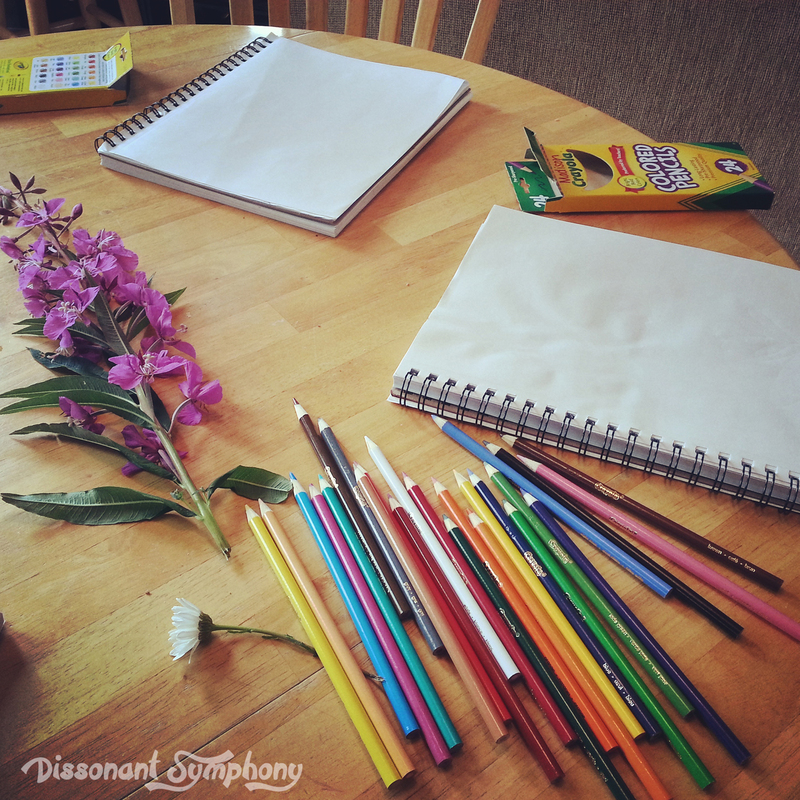 All content © dissonantsymphony.com and Dissonant Symphony 2014- Present. Unauthorized use and/or duplication of this material without express and written permission from this blog’s author and/or owner is strictly prohibited. Excerpts and links may be used, provided that full and clear credit is given to dissonantsymphony.com and Dissonant Symphony with appropriate and specific direction to the original content.